We headed out this morning in 3 SUVs as we had the 10 of us plus Jones Laviwa, GAIA’s outstanding Country Director, as well as Alice Bvumbwe, Chief Staffer in Blantyre and Gertrude Chipungu, Chief Staffer in Llongwe as well as 2 drivers, Austin and Daniel. Our first stop was the GAIA office which has been built in the past year, has covered spaces for 5 vehicles, a round thatched Malawian equivalent to a gazebo plus unused land within the fenced-in property now owned by GAIA. We will see the interior another day. We head east again toward Mount Mulange but after 45 mins turn right through the tea fields on a dirt road toward Mpala. Along the way are groves of trees planted by the tea plantation owners as a way of insuring they hold their adjacent properties by impending the villagers from building houses there. After a long drive through well maintained tea plants, all hand picked and irrigated with sprinklers, we begin passing by the now familiar huts of the villagers with thatched roofs and end up on the Mpala school property. We are welcomed into the one school block (room) of the existing 7 that has desks. In the other blocks, the children sit on cold concrete floors during the winter. 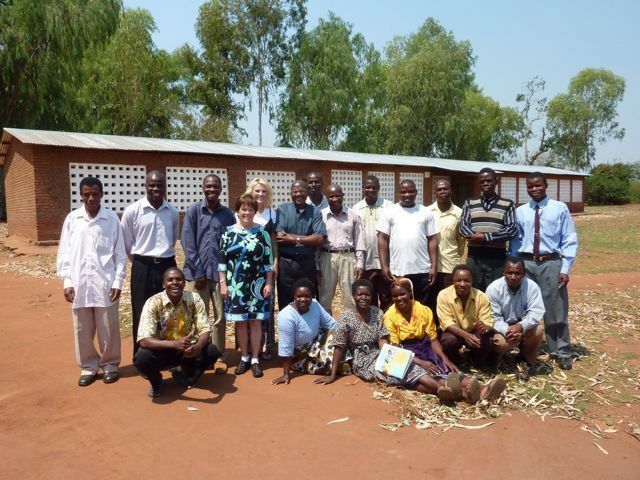 The purpose of this meeting is for the Hamels Foundation, represented by Heidi, to discuss with the Mpala chiefs and the head of the current Catholic school (taught by teachers who are not necessarily Catholic sent by the Malawian government) as well as some of the teachers the school renovations and additions that the foundation is committed to funding with GAIA’s support. Currently this is a primary school only and serving 2,400(!) students with 18(!) teachers. With only 7 classrooms, one of which has a leaking roof, most of the classes are held outside without even a chalkboard. The message delivered graciously by Heidi, Bill and Jones was that GAiA and the Hamels Foundation are not bringing Mpala a gift but rather are partnering with them for the benefit of their children. The details of what exactly is being proposed were laid out by Heidi who asked for input from these leaders and made it clear that this is their community project that once complete must be something with which they are all pleased. Jones did a beautiful job of encouraging them to give honest feedback about what exactly they want giving the analogy of the uselessness of a Muslim taking pork offered to him and then throwing it away – it certainly makes much more sense for him to be grateful for the offering but turn it down. Thus this school project will only make sense if it is what the community actually wants, will use to it’s fullest, maintain it and be proud of it. With a very open exchange then, some details were decided about staging, timing, location of different pieces of the project etc. to everyone’s satisfaction. In the end, the head of school and the principal chief expressed their gratitude and spoke of how fast the word would travel through their villages and how excited all the people would be to hear it. It was a fascinating interaction with a successful outcome for all sides and all the more interesting because of the poise and engaging spirit that Heidi, a 29 year old slightly built blonde American, displayed addressing a room full of Malawian men and only 2 Malawian women. We toured the run down grounds including an old teacher housing structure that has been out of use for a long time and left to the termites who have built numerous mounds inside. Before leaving, Shirley had a group of 30 os so Malawian children dancing with her – great fun – and then the two of us helped some of the Malawian women turn a merri-go-round type of pumping structure which pumps water for the villagers – also fun and a but of a workout! On the way back out to the main road, we stopped at a carpentry shop which housed a youth club project run by a young man named Victor who proudly showed us the furniture the group had made. 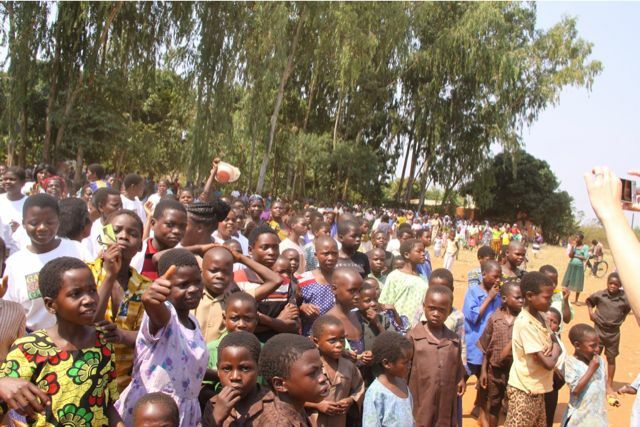 This youth club is one of the activities sponsored by GAIA which trains the youth in a skill they can have for life while building their self-confidence in so doing and keeping them focused on a useful endeavor which diverts them from other trouble an adolescent might get into, all of which plays a role in reducing the potential for HIV transmission. Back in the cars and shortly we come to the village of Nsona, which is part of a cluster of 3 villages in their 3rd year as GAIA villages. Here we are again sung and danced into a gathering under eucalyptus trees where we are seated in the front row while 700-800 villagers are seated and standing in a circle in front of us. A ceremony similar to the one the day before unfolds with one of the GAIA caregivers as MC, a prayer, introductions of chief representatives and the US visitors, a speech by Bill encouraging testing and treatment as necessary for pregnant women, and a speech by an HIV+ man who spoke about the importance of coming to grips with the disease in terms of being tested and then getting on ARVs which give you back your life in the event you have contracted the disease. A grandmother then spoke in great detail about how grateful she was for the support GAIA had made available to her grandchildren. There were dances by adolescents and then the 50 or so caregivers, all in white blouses, entered the circle singing praises to GAIA and how they did not want us to leave and then, of course, they pulled the visiting American women into the dance – we did our best and certainly entertained them for all sorts of reasons, no doubt! Back to the Assemblies of God for a meal of leftovers and a good night’s sleep, at least until the 4:50am call to prayer from the neighboring mosque and/or the cockadoodledoos of the neighboring roosters! 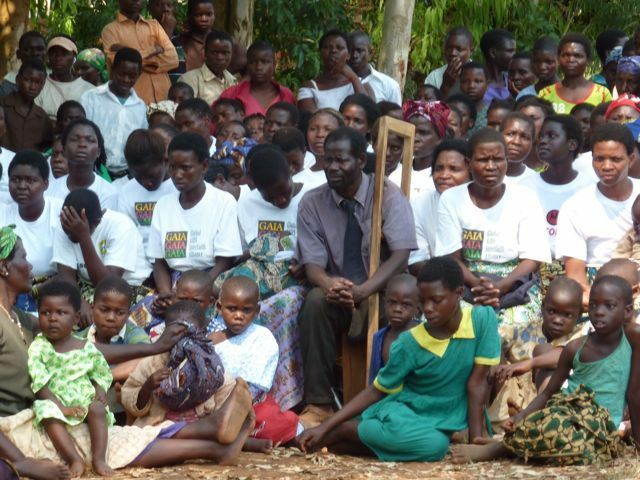 This entry was posted in Uncategorized and tagged AIDS, GAIA, Malawi, Mpala. Bookmark the permalink.